My first experience at Terre a Terre was my 22nd birthday, a thousand years ago, and I’ve enjoyed the occasional treat at the all vegetarian restaurant since. One of my top global favourites when it comes to dining out, the staff are friendly and the food is immaculate. The presentation is as impressive as the flavour, and I hope this never changes. They offer plenty of vegan items, but with the talent and finesse Terre a Terre chefs have with food, surely they don’t need to be so dairy intensive? 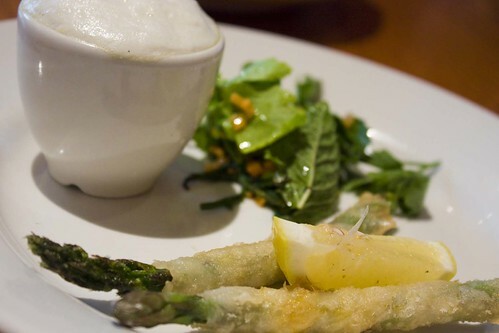 The Great Growers Menu, a £10 (two course) and £15 (3 course) menu, features seasonal produce grown locally, and is a great way to highlight this country’s summertime garden delicacies. I was excited for this because after trying samphire for the first time ever this year, I was looking forward to some more. Unfortunately my plate came with only a mere sprinkling of this marshy vegetable, but my friend had plenty so graciously shared. I should have complained, really, but I was so taken aback by the soup that I sort of forgot about the rest of the dish. Creamy, perfectly salted, and delicious, this soup makes broad beans even more heavenly than they already are. Broad bean lemon thyme espresso with samphire, linseed flowery leaf relish and fried asparagus soldiers. This was so good I licked the plate. Well, almost, but my lunch buddy did say something along the lines of “I wondered how long it’d be before you did something ridiculous.” Okay, so table etiquette may not be my forté, but I know a good meal when I have one, and this was sublime. 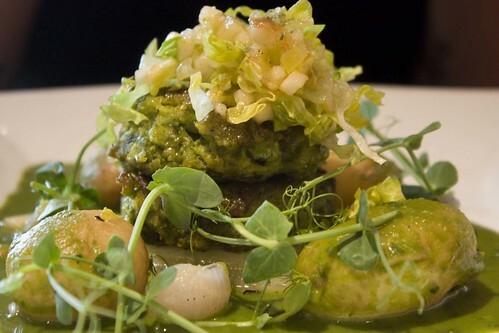 British pea and parsley pikelets with St Germain sauce, a warm salad of seared lettuce, shallots and baby potatoes, finished with lovage salt and mint oil. I’d heard good reviews of this pudding, and they were certainly accurate at the very least. This. Dessert. Was. Outstanding. I don’t care who you are and where you live, get your arse on a plane/in a car/on a train/in the hold of a boat, and come eat this. Now. 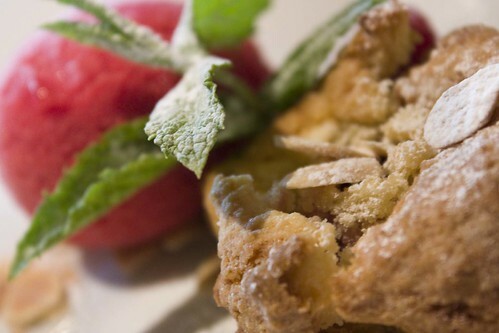 Raspberry frangipane tartine served with raspberry sorbet. If you’ve never had a meal at Terre a Terre, for whatever reason, set aside a few quid from your next pay day and treat yourself. It remains one of my favourite restaurants for a number of reasons. While their vegan options may be limited, the menu changes often enough and there’s always something to entice my appetite. I love terre a terre, that food all looks fab. Especially pudding!! I had the frangipane cake last time I was there, but a raspberry one sounds awesome. I've never been, it looks good food, but a bit to “fussy”. Good to try for a one off through as the food looks really good!! Food for Friends is okay, but they need to offer more on the vegan end of things.